A mass die-off of marine life this week at Surfrider Beach coincided with a breach of Malibu Lagoon. Today’s guest blogger is Sarah Sikich, Heal the Bay’s Coastal Resources Director. She’s also a Malibu resident. When people talk about the Malibu stench, it’s usually in reference to septic-related smells. But, there’s a different stink in Malibu right now – that of rotting, dead marine life along Surfrider Beach. It’s impossible to walk along the stretch of beach between the Malibu Pier and the Colony without noticing the thousands of dead urchins washed ashore, strewn amid the seaweed, driftwood and swarms of kelp flies. 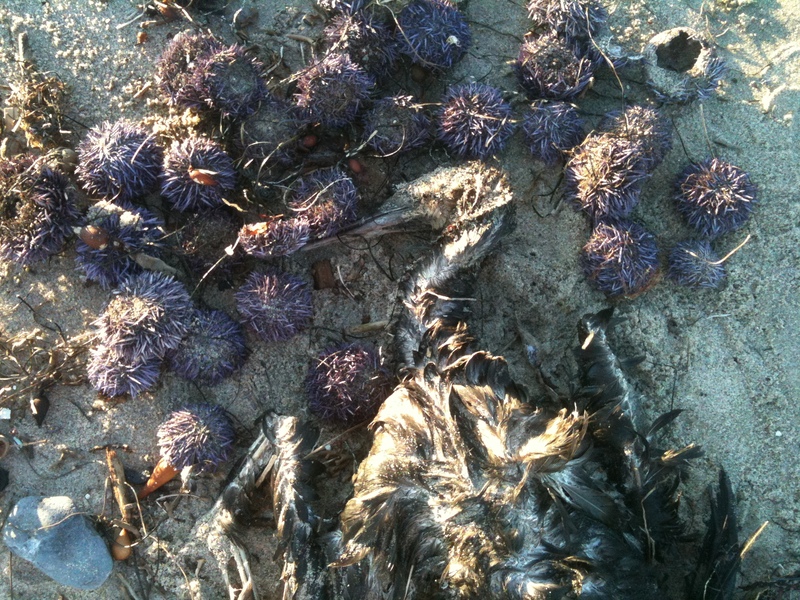 There’s even an occasional dead lobster, sea hare and seabird in the mix. I noticed it first over the weekend after heading to Surfrider for a mid-day surf. I had to tread carefully across the beach to avoid stepping on the prickly decaying urchins. I went back down to the beach this week to take some photos of the shocking mass mortality. Some folks may remember a similar die-off October of last year, after someone artificially and illegally breached the lagoon in advance of projected good surf. The recent mortality seems to have coincided with the breaching of Malibu Lagoon last week. The latest breach occurred near Third Point toward the end of last week, around the same time as our first storm of the year, as well as a late season south swell. 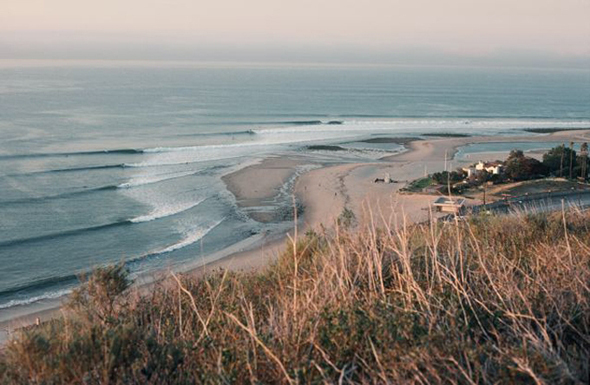 The city of Malibu scored an absolute knockout Thursday in Round 3 of the battle for improved water quality at Surfrider, Malibu Lagoon, and nearby beaches. Watching Malibu City Attorney Christi Hogin close the done deal for weakened septic system regulations with the Los Angeles Regional Water Quality Control Board was like watching boxing champ Manny Pacquiao take on Woody Allen. No contest. Hogin should be in line for a big raise for negotiating a deal for Malibu that will save ratepayer’s millions at the probable expense of water quality at beaches visited by millions of visitors each year. And she did this when Malibu’s only leverage was its stated threat of litigation against the Regional Water Board for enforcing previously approved prohibitions. The board had already unanimously voted for regulations against new septic tanks and the phase out of existing ones in the civic center area in favor of a centralized waste water treatement and recycling facility. The reward for Malibu’s threat to sue was a unanimous 6-0 Regional Board vote to approve a MOU that severely undercuts the previously Board approved Basin Plan amendment to prohibit land discharges of sewage in the Malibu civic center. Despite a nearly five-hour hearing, and extensive testimony from Santa Monica Baykeeper, Surfrider Foundation, Malibu Surfing Assn., Heal the Bay and many others, the board only made trivial changes to the MOU. Does the Regional Water Board have the stomach for house-to-house septics enforcement in Malibu? Round three on the great debate over what downtown Malibu will do with its sewage is scheduled for the Regional Water Board hearing this Thursday in the nearby beach city of Glendale. Will the infamous Malibu smell waft into olfactory history? The answer may or may not be clearer after Thursday. As I previously blogged, the proposed wastewater Memorandum of Understanding (MOU) has many flaws including: no true accountability for the city of Malibu in the event residents reject a sewer assessment fee; the creation of a new, enormous Phase 3 with a compliance period of 2025, and even then, only if studies demonstrate that onsite septic systems are contributing to water quality problems in Malibu Lagoon; and the inclusion of systems in Phase 3 (Malibu Road, much of Winter Canyon and the Hughes Lab on the hill) that would have to defy the laws of physics to pollute Malibu Lagoon, but not groundwater or Malibu’s beaches. I’m sure the fact that Phase 3 residents have as good a chance of approving an assessment district as winning the state lottery had nothing to do with the creation and geography of the third phase. Water quality in Malibu Creek and Lagoon, and Surfrider Beach is too important to gamble with. The MOU must be strengthened and Malibu must to be held more accountable for implementation. Tonight, the Malibu City Council will vote to approve a Memorandum of Understanding (MOU) between the city and the state to move the civic center’s wastewater management into the 21st century. Malibu fought to become a city when L.A. County tried to jam a massive sewage treatment plant in pristine Corral Canyon down their throat. For the last two decades, the tradition of fighting for septics over sewers has been a city obsession. The MOU vote tonight will greatly weaken the Regional Water Board’s order prohibiting land disposal of sewage (leach fields) by 2015 in commercial areas and 2019 in the civic center’s residential areas. Since the State Water Board upheld the Regional Board’s order last December, Malibu and the Regional Board have been meeting regularly to weaken it. Malibu opposed the original order, but they didn’t sue over it because the State Board was willing to modify its terms. One of the order’s big issues was the inclusion of residential areas like Malibu Knolls and Sweetwater Mesa, which likely had no water quality impacts on the highly polluted Malibu Lagoon and Surfrider Beach. If those were the only changes, then a simple MOU modifying the order would have been universally supported. But this is Malibu, so nothing is ever simple. Horse Sense at the Coastal Commission? 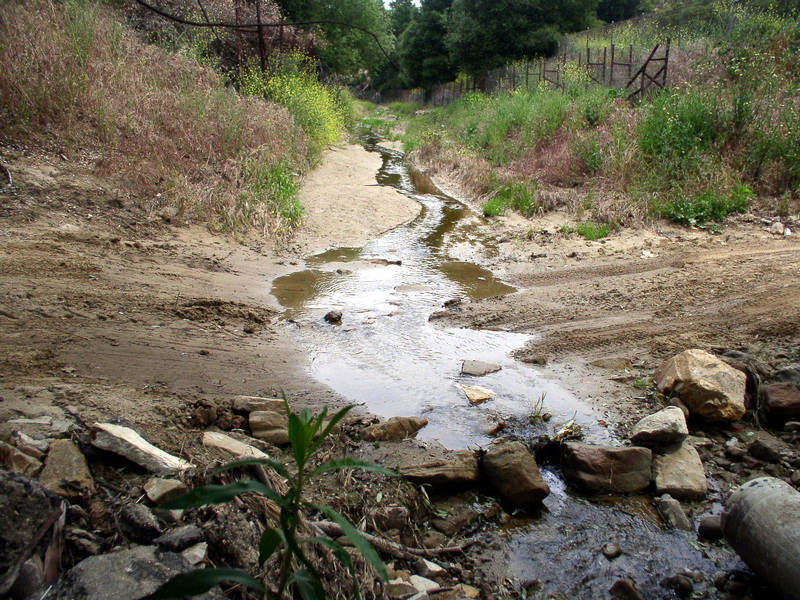 Malibu Valley Farms' dubiously permitted equestrian facility impacts water quality in the Stokes Canyon Creek area. The permit is up for a revocation vote Thursday. The media spotlight at the California Coastal Commission hearing Thursday will be on the fate of a complex of mansions proposed by U2 guitarist The Edge on pristine chaparral and coastal sage habitat in the Santa Monica Mountains overlooking the Bay. Although the “Joshua Tree” concert at the Sports Arena in 1987 was one of the best performances I’ve ever attended (I still get chills when I hear the intro to “Where the Streets Have No Name”), Heal the Bay is very critical of the project’s impacts on Environmentally Sensitive Habitat Area, the lack of Low Impact Development (LID) requirements to capture and reuse or infiltrate rainwater on site, and the complete lack of information on wastewater treatment and disposal. Despite the attention on the Edge’s project, a far more critical Coastal Commission vote will take place on Thursday regarding Malibu Valley Farms. In this case, the project applicant had the nerve to build a horse ranch in and directly adjacent to Stokes Canyon Creek, a tributary to Malibu Creek, which drains to the highly polluted and popular Malibu Lagoon and Surfrider Beach. The developer built the ranch in this environmentally sensitive riparian area, with concrete and dirt crossings in the creek (instead of much more environmentally friendly bridges) without permission from the Coastal Commission, and then had the gall to ask for an after-the-fact permit. What did the Commission do in response to this illegal development? Did members bring down the hammer of enforcement? Absolutely not! 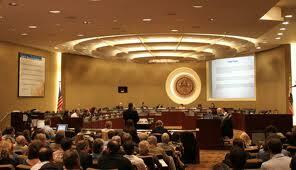 The Coastal Commission voted 11-0 to support Lagoon plan. 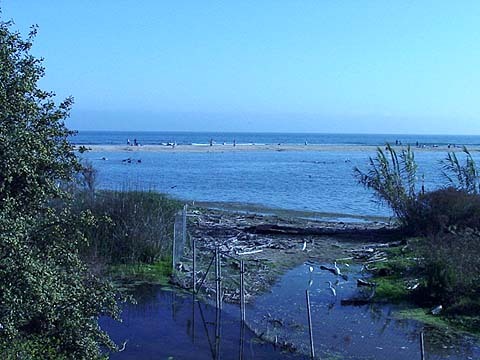 The California Coastal Commission voted unanimously Wednesday to support the State Parks and Santa Monica Bay Restoration Commission plan to restore Malibu Lagoon. The 11-0 vote provided the last needed permit approval before the rehabilitation of the brackish wetland can proceed next summer. The restoration will increase salt marsh acreage by four acres and will provide long-needed water circulation to the often stagnant marsh, but there was still vocal opposition against the project. The challengers even brought in a high-priced attorney and an East Coast wetland restoration consultant to bolster their case, which argued against the use of heavy machinery to repair the wetland. Despite these efforts, the recommendations of the Bay Commission, Coastal Conservancy and State Parks prevailed. Heal the Bay helped put together the plan back in 2004. Key testimony from renowned UCLA coastal ecologist Rich Ambrose and wetland nutrient scientist Marth Sutula was very persuasive. The U.S. Fish and Wildlife Service, state Fish and Game, the National Marine Fisheries Service, and the Regional Water Board all had previously signed off on the project. Environmental group support from Santa Monica Baykeeper, the local Audubon, Surfrider and Sierra Club chapters, Malibu Surfing Assn. and Friends of Ballona didn’t hurt either. Evidently, successful wetland restorations at Bolsa Chica, Carpinteria and San Diego County that used earth moving equipment helped sway the commission that the Malibu plan is prudent. Malibu Lagoon is sick and needs repair. Tomorrow marks a milestone day for environmental rehabilitation in Malibu, Surfrider Beach and Santa Monica Bay. The much-needed restoration of oxygen-starved Malibu Lagoon faces one more regulatory obstacle Wednesday — California Coastal Commission approval. Because the project has gone through an extensive public involvement and CEQA process, including a legally unchallenged EIR approved in 2006, one would have hoped that the effort to remove polluted sediments and rebuild the lagoon would remain free of controversy. The plan remains one of the five highest priorities in the Bay Restoration Plan assembled by the Santa Monica Bay Restoration Commission. The Malibu Lagoon restoration effort, which has been led by Heal the Bay scientists under the auspices of State Parks and the Coastal Conservancy, took more than two years to develop. Some of the foremost wetland scientists in California participated in assembling the plan, including UCLA’s Rich Ambrose, Humboldt State’s Bob Gearhart, UCSB’s Andy Brooks, L.A. County Natural History Museum’s Kimball Garrett, USF’s John Callaway and the Southern California Coastal Waters Research Project’s Marth Sutula. But welcome to Malibu, where every issue is destined for controversy.